To sign up for any of these Block of the Months call or email us at 620-375-2044, prairieflowerquilts@yahoo.com. You can come to the store to pick up, or we can mail it to you. This is a 10 month Mystery Quilt. You purchase your material at the beginning of the class and get instructions each month. You can choose the use this color way, or choose your own fabrics. There are 2 sizes to choose from, Sweet Single 70 X 98 or Quaintly Queen 101 X 104. $35 registration fee. Classes are the 4th Monday of each Month, starting on January 28th at 6 pm. This is a 6 month Block of the Month program. You will do 2 blocks each month. It is a combination of embrodery, applique, and piecing. Classes are the second Friday of each month, starting February 8th at 2pm. You can come and sew, or just pick up your blocks. This is a 10 Month Block of the Month. You can choose from 2 color ways, Quarry Batik or Porcelain. The finished quilt is 104 x 104. Classes will be the second Monday of each month, starting on February 11th at 6pm. $25 per month - includes 15 yard of material and pattern. This is a 12 month Block of the month. You can choose from 3 different color ways - black/white/turquoise, kansas troubles, or pastel. the finished quilt will be 81 x 99. Class fee is $15. First block is $5. If you bring in your completed block to the next class or the Monday after the next block is free. If unfinished the next block is $5.00. You will have the option to purchase a setting kit each month for $4 or wait until the end to purchase a setting kit. This is a 10 month program, using Jen Kingwell's pattern and templates. 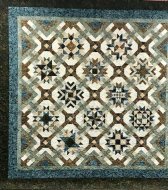 We will be using Edyta Sitar's fabric line Crystal Farms and some of her newest line called Sequoia from Laundry Basket Quilts. You will get 9 fat 8th's each month and corresponding template ( if there is one for that month). Cost will be $25/ month. Classes start February 12th at 6:00 pm. and will be held on the second Monday of each month. You do not need to come to the classes, you can stop by and pick up, or we can mail them to you. The Tonga Mystical Treat collection features twenty fabrics in a palette of deep blue to turquoise with purple accents. 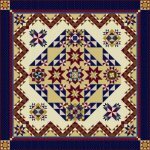 Resembling a kaleidoscope, the Mystical Prism quilt uses traditional piecing with unusual fabric color combinations. Quilt size is 102” square (King size) and is currently on display in store. Bow Diddley is a 12 month Block of the Month program beginning February 4, 2017. You have 3 colorways to choose from, Light Blue: 30s fabric, Brown: Kansas Troubles fabric, or Black Flower Colorway fabric. This BOM costs $5/month plus shipping. Your finished quilt will measure 92" x 92". 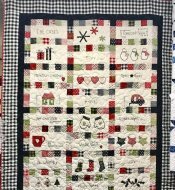 This quilt is on display at our shop if you want a closer look! This awe inspiring Block of the Month program is dedicated to Hannah Cummings Cotton - her legacy, her plantation life, her children, and her journey to freedom to Ohio leaving the chains of slavery behind. Your finished quilt will measure 97" x 97". The Golden Age, is a 7 month program. It includes the pattern and the fabric for your quilt top and binding. With each month's pattern you will receive a short biography of a legendary actress who lived and worked during one of the most glamorous times in Hollywood history. The finished quilt measures 79"x79". Southern Exposure is a beautiful floral collection by Laundry Basket Quilts for Moda Fabrics. It's a 6 month class. 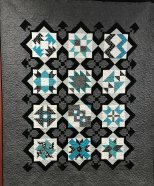 You can choose to create your quilt from two colorways. Come in our shop to view the fabric and for more information.